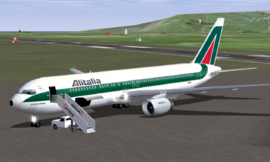 Welcome to the January 2010 edition of the FlightGear Newsletter. The newsletter is going from strength to strength, with the October edition having over 11,000 views in just 3 months. It is very gratifying to see such interest, and really shows the increasing size of the FlightGear community. 1 So where's the new Release? So where's the new Release? In the last edition, I expressed the hope that the new FlightGear release would be available by the time the newsletter was published. Well, that didn't quite happen due to a combination of factors. So, I'm writing this edition in the same hope! I know that there are lots of people running v1.9.1 looking forward to the new release, and I can promise that it will be worth the wait. To whet your appetite, Durk has produced some very nice screenshots here. 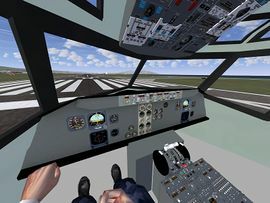 Even though I personally run the CVS version of FlightGear, I'm particularly looking forward to the new release so I can point some of my friends at it. Just after the new year I had a couple of friends staying over. None of them are gamers, and certainly not flight-sim enthusiasts, just normal well-adjusted people. One of them used to fly when they were at university, and expressed an interest in seeing what FlightGear was about. So, I loaded up a Cessna at the local airport (Edinburgh - EGPH), and let them have a fly around. They were amazed at the level of detail and had a great time flying around recognizing landmarks. So, once v2.0 is released, I'll be sending them an email pointing them at the download. 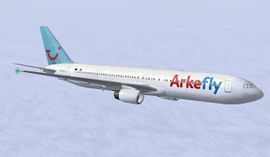 For over a year, realistically (meaning: they exist, have existed, or will exist on the corresponding aircraft with the corresponding airline) FlightGear liveries have been available from this website. Due to the increasing amount of visitors and liveries, the website has moved to a new server, resulting in much faster downloads. The server switch was a good oppurtunity to re-design the website and its internal structure. It used to be a simple list, now it is as a fully functional database, improving the use and maintainablity significantly. The database can be searched by aircraft, airline or author. Everyone is free to upload his/her liveries, which can be done through this page. See Boeing 767-300 for the main article about this subject. For a while the 767-300 has been a slow moving project, due to Isaías V. Preste temporarily leaving the forum and all FlightGear works. Liam has yet continued on from where Prestes left off, given a complete overhall to the old FDM, added plenty of new features and started animations. Thanks to the whole FlightGear community for providing some nice liveries, sounds, and other assistance to questions. Since the initial writing of this article, it has now been submitted to CVS before the next release of FlightGear, with some new features not yet seen on many other Aircraft in FlightGear. This is a truly promising project, and deserves its place in the downloads page at long last! See Boeing 737-100 for the main article about this subject. The Airport of Manila, Philippines (RPLL) has been improved. Besides Terminals 1 and 2, Terminal 3 has now been added. The Tower has also been redesigned to more accurately reflect the original. Many shared models on the ground have been added and as always all buildings are [[Howto:|illuminated]] at night and ambient occlusion has been added to all new textures. Overview of the SFO airport. See San Francisco International Airport for the main article about this subject. With the upcoming release in mind, FlightGear's main airport has been populated with more buildings than ever before. Dock your plane at one of the many gates, follow the airtrain as it moves from station to station, land your helicopter in the famous parkingarea hole or simply enjoy the visuals on final. In addition to this, the terrain has been refined, especially the bay area. These changes will be available with the next scenery release. On 4 January 2010, the 900th article was added to the wiki! Back in May 2009, the 700th article was welcomed, which means an average of 1 article is created each day. A big "thank you" to all those who helped to extend and improve the wiki over the past years! Read the article at Howto: Add details to your airport‎‎. Thanks to Dutch FlightGear user Rob, we now have 12 multiplayer servers! The new server is located in the Netherlands and can be connected through mpserver12.flightgear.org. We would like to emphasize the importancy of picking "the correct server". Doing so will decrease the individual server load, resulting in faster servers, which is nice for everyone. Check the howto to learn what the best server is for you. The Forums have been the site of some quite heated debate about the future of the FlightGear VAs, discussing the question of whether there are simply too many VAs given the FlightGear user population. Not being an heavy metal sim-pilot (I spend far too long being self-loading freight IRL), your correspondent is not qualified to comment. Like the early days of air-transport, there are a large number of airlines in existance. Time will tell whether this is sustainable or not. Those interested in MP flying with active ATC are as always encouraged to take part in one of the TransGear Airways events. These are run monthly, and are a great way to fly with other people in a fairly realistic environment. FGCOM is an external program which works hands in hands with FlightGear to provide radio communication, in particular for multiplayer users. The feedback on various forums and IRC shows that a lot of people, who are not specially at ease with command line usage, find it difficult to setup and launch FGCom. This is where a new little piece of code comes to rescue. Tuxklok created FGComGui, a simple graphical user interace front end to fgcom, which aims on making FGCOM easy and friendly in use. The FGComGui is currently developed and tested under Windows and Linux environments, but it seems a Mac version is to be expected. Once installed, the FGComGui does just what you would expect. Using your mouse and a few clicks, you can drive FGCOM painless, from initial setup, testing, to normal usage. You can even set a few options with nice menus, notably the audio volumes and the port used to talk to fgcom. FgcomGui docks as a tray icon (see the screenshot on the left), making it possible to monitor its status while flying, and easily stop it or restart it if needed. So if you feel FGCOM is a bit difficult to use from command line, or you are just willing an easier FG pilot life, do not wait anymore and try it! Installation is described on the author's Google Code page, but it can be worth mentionning that so far the linux build is only optimized for Ubuntu users. Other distribution users can take a look at this forum for some hints about how to build in their environment. Hopefully this will be a step towards a more generalized use of radio communications in networked flight, which are a great improvement for simulation realism. 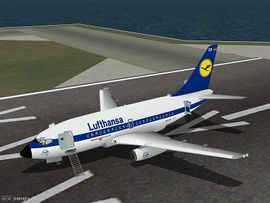 FlightGear 1.9.1 has been voted "best free game" of 2009 by Softonic. While we might not agree with some of the comments in the review, it is another sign that FlightGear is becoming more and more visible.